Sunshine Through the Rain: I did it! I have to say, I am so proud of this finish. I love the accuracy I achieved in this quilt, and I love the colours. It is the biggest quilt I have made and it took me a while to get used to quilting it on my little machine, but the Aurifil thread worked a treat and I think the straight lines, about 1 inch apart give a lovely texture. I tried to stick with using only fabrics from my stash, which meant using my hoarded Ikea fabric for the back as it was the only piece that I had that was large enough! And I even remembered to include one of my labels! It will be hard to give it as a gift, but I know my friend will love it! 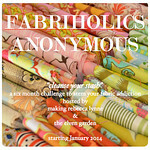 Linking up with Sew Cute Tuesday at Blossom Heart Quilts. This is also my February finish for A Lovely Year of Finishes, and is a Q1 Finish for the 2014 Finish A Long. Wow Deborah!!! That is totally stunning. The fabric combination is divine and the blue borders around all the blocks makes all the different fabrics pop. The person you are giving it to is very lucky! You SHOULD BE PROUD! lol It's just gorgeous! The colors are perfect. Thanks for sharing. It's fabulous - you've done a great job with the quilting which, as you say, gives it lovely texture. I can see why it was hard to give away, it's a fabulous quilt! I bet your friend loved it. Yay, well done on a fabulous finish!!! Oooh! You're quilt is purely eye candy. Congratulations!!! It's absolutely gorgeous you should definitely be thrilled to bits with it and I am sure your friend will be too ! This is just a gorgeous quilt!! Well done!! This is totally beautiful. I really love your fabric choices the colours are amazing. Congratulations Deborah it is a gorgeous quilt. The straight line quilting is perfect. I'm sure your fiend will love it. It's wonderful! That IKEA backing is just brilliant. Very generous of you to part with it. 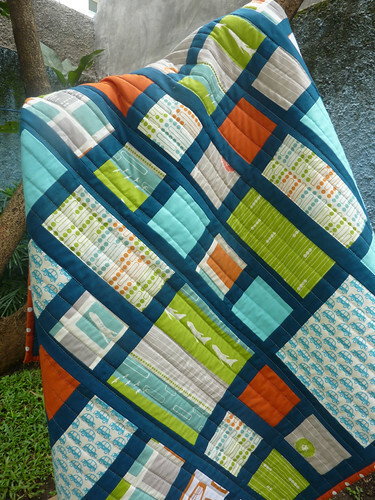 I think the straight line quilting is great, too. This is exactly the sort of quilt I need for a little boy I know. What are the fabrics? Fantastic finish, Deborah! 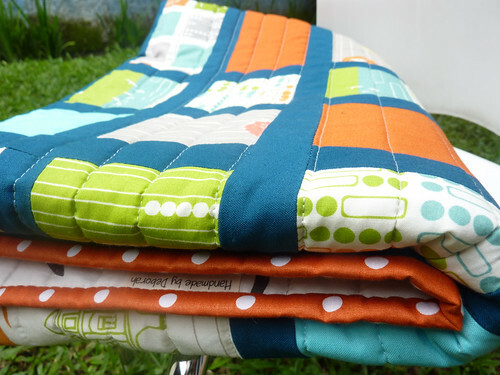 The straight line quilting looks great on it. I never remember a label - I have not yet put a label on a quilt because I always forget!! Congrats! It sure looks gorgeous! Congrats on your finish. It's beautiful! 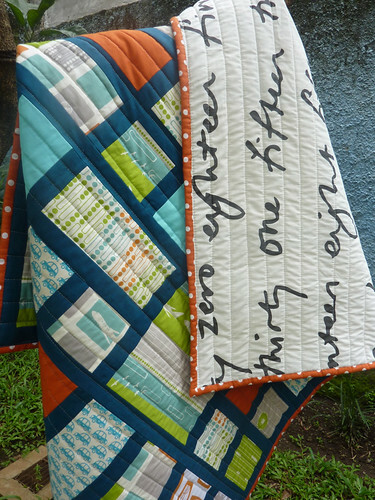 I love the color of the sashing, and your quilting looks great. Gorgeous finish. I love the colors you chose for this one. Lovely!! Great pattern and perfect use of stash fabrics!! Your quilt has a wonderful balance of colours which work perfectly with this design. I'm sure it will be loved a s gift, all the better that it has you label on it too. Oh My Goodness! Deborah, that is so lovely. 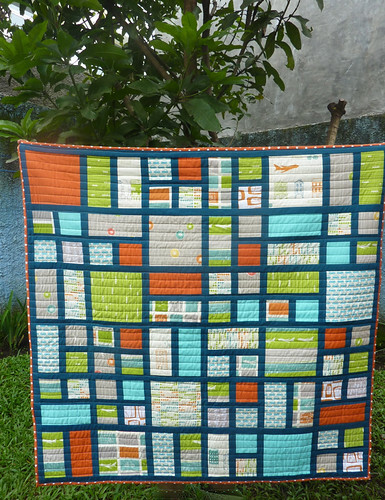 I love the precision of the blocks and the straight line quilting and the colors your chose. Really, really beautiful. Thanks for sharing your artistry with us. So beautiful, and I completely agree that the colours are amazing! Well done with the quilting too! Beautiful quilt ~ I love the straight line quilting! The straight line quilting is all that this needed. Beautiful. I'm about to jump in quilting my next quilt myself. How did you find it on your domestic machine? My first ever WIP Wednesday!